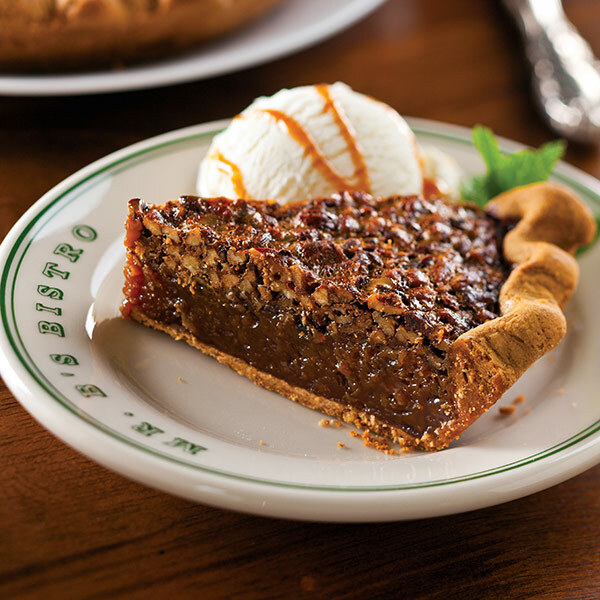 Our crust makes this pecan pie special. Seasoning is important, so we season our pie crusts with cinnamon and nutmeg. The crust will be a little darker than most. Make pie dough: In a large bowl with an electric mixer beat together butter and sugar until pale, about 3 minutes. Beat in egg until just combined. In another bowl combine flour, cinnamon, nutmeg, and baking powder and gradually fold into sugar mixture until incorporated. The dough should look rough, not smooth. Press dough into a round flat disk and wrap tightly in plastic. Chill for at least 30 minutes, preferably 2 hours. Remove dough from refrigerator and let stand at room temperature 30 minutes. On a floured work surface roll dough into a 13-inch round, fit it into a 9-inch pie pan, and trim the overhanging dough to 3/4 inch all around. Make filling: In a large bowl whisk together sugar, dark corn syrup, butter, eggs, vanilla, and salt. Place pecans in the pie plate and pour filling over them. Stir pecans and filling, being careful not to poke crust. Bake pie until edges are firm and center seems set but quivery when the pan is nudged, about 1 1/2 hours. Serve warm with vanilla ice cream.